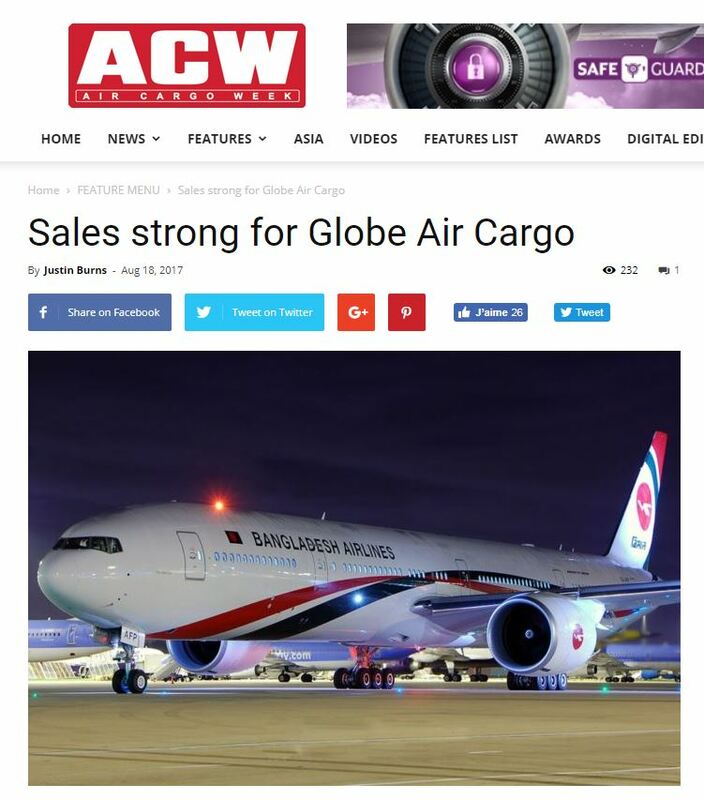 Strong industry performance has boosted year-on-year sales revenue by six per cent this year at Globe Air Cargo with all carriers it represents seeing surging numbers. The ECS Group subsidiary sells cargo in the UK for Aeromexico, Biman Bangladesh (pictured above), Bulgaria Air, China Southern, Czech Airlines, Gulf Air, Middle East Airlines, MNG, Royal Air Maroc, Ukraine International, UPS Cargo, and Vietnam Airlines. The general sales and service agent also sells for Kenya Airways in the North of England, Westjet in the South of England and some group products with Corsair, Niger Air Cargo and MIAT. Globe Air Cargo managing director, Michelle House says growth in airfreight demand continues to increase due the recovery in global trade. She explains: “As a result, since the last quarter of 2016, we observe additional export growth and resulting improvement in our volumes. Of course, this impacts all of the airlines we represent. House notes Middle East Airlines has moved to a GSSA within the past 12 months and Westjet came online into London Gatwick and outsourced their cargo sales activity as well. The strongest lanes are Mexico City, Hanoi and Ho Chi Minh City, while China is still strong and the Middle East remains robust. As for the performances of different verticals, since the last quarter of 2016, Globe Air Cargo has seen an increase in freight volumes generated by pharmaceuticals and e-commerce traffic and both remain strong. House says transit times are imperative with both products and the industry has had to work hard to meet these growing demands, while it has also noticed an influx of Norwegian fish ‘flooding’ into the UK market this year. The weakening of the pound has helped UK exports, but has this boosted numbers, or not? “Yes, I believe it’s behind some of the growth we are seeing, that said, it presents a challenge when we report in local currencies to some of our airline customers,” House says. She believes the impact of Brexit on the UK all depends on the trade agreements that are reached, but it is still unknown whether it will make it harder for GSSAs. House says: “It’s pretty complicated to predict the real impact, but I’m fairly confident that production will remain positive and assuming no change to the weak pound then exports should continue to grow steadily.